After discovering nuclear weapons have been smuggled into America, Senior FBI Agent Shane Daughtry faces his toughest job. This action feature film with a political edge is packed full of suspense and drama as the clock begins to tick! With the Middle East in turmoil, Israel's preeminent ally is thrust into an impending war - America is now the target as the battle for Jerusalem begins. Based on the bestselling book by Dr. John Hagee, 'Jerusalem Countdown' highlights the reality of an inevitable conflict between Israel and Islam. When nuclear weapons are smuggled into America, Senior FBI Agent, Shane Daughtry (David A. R. White) is faced with an impossible task - find them before they are detonated. The clock is ticking and the only people who can help are a washed up arms dealer (Lee Majors), a converted Israeli Mossad Agent (Stacy Keach) and a by-the-book CIA Deputy Director played by Randy Travis. Nuclear holocaust on American soil threatens global stability and the impending destruction of the world is coming to fruition, in this film of international terror and suspense. Also featuring Nick Jameson, Jaci Velasquez, Marco Khan, Carey Scott and Anna Zielinski. 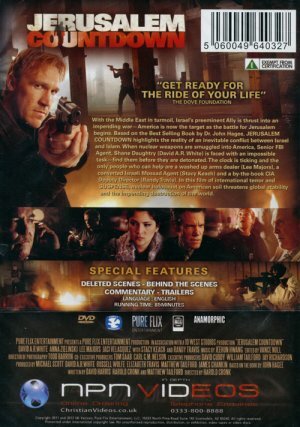 If you're fans of 24, you'll love this action packed thriller with it's biblical message. The film was classified as a PG-13 in the USA when it went on general release. 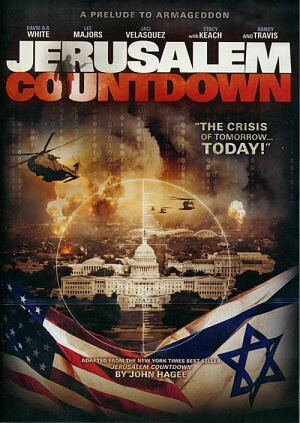 Jerusalem Countdown DVD was published by NPN VIDEO in February 2013 and is our 1310th best seller. The ISBN for Jerusalem Countdown DVD is 5060049640402. Be the first to review Jerusalem Countdown DVD! Got a question? No problem! Just click here to ask us about Jerusalem Countdown DVD.